“… deputies at the Tulsa County Sheriff’s Office raised concerns about Reserve Deputy Bob Bates’ training for years, but were intimidated to keep quiet.” -newson6.com . . . . . . . . . . . . . . . . . . . . . . . . . . . . . . . . . . . . . . . . . . . . . . . . . . . . . . . . . . . . . . . . . . . . . . . . . . . . . . . . . . . . . . . . . . . . . . . . . . . . . . . .
—“Tulsa County Sheriff Stanley Glanz announced Monday morning that Undersheriff Tim Albin is resigning. Tulsa Undersheriff Tim Albin told News On 6 crime reporter Lori Fullbright he is retiring as of May 1, 2015. Whether it’s a retirement or resignation, it comes following the release of a document that showed concerns about the special treatment of a reserve deputy involved in a fatal shooting earlier this month. Tulsa County Sheriff Stanley Glanz announced Monday the resignation of Undersheriff Tim Albin in the wake of documents released that allege Albin intimidated employees to elevate a reserve deputy in the program. . . Glanz’s statement came during a Tulsa County Board of Commissioners meeting Monday morning. A Tulsa World request to interview Albin was denied. The Sheriff’s Office memo obtained Friday by the Tulsa World details the findings of a 2009 “special investigation” requested by then-Undersheriff Brian Edwards into claims of falsified documents and improper training for Robert Bates. It concludes with allegations that Bates received special treatment and that current top-ranking deputies violated policy in a number of ways to elevate Bates in the reserve deputy program. 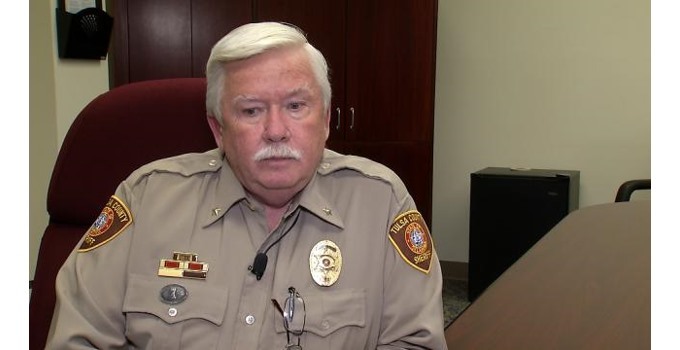 After Monday’s county commission meeting, Glanz was asked how the report was recovered by his office after Sheriff’s Office officials said last week that they had no such record of the investigation in their files. Glanz gave no explanation, saying the records had been on file all along. Albin and Maj. Tom Huckeby are referenced throughout the report, which details allegations of intimidation of staff and the altering of documents. . .
. . . Smolen, Smolen and Roytman, the law firm representing the Harris family, also issued a statement Monday, calling for the sheriff to do more. Huckeby, a 23-year veteran of the Sheriff’s Office, was also a focus of the 2009 investigation that concluded he intimidated staff. Huckeby told investigators he acted at Albin’s command. This situation is fallout from the shooting death of Eric Harris by Reserve Deputy Bob Bates. Bates is a close friend of Tulsa County Sheriff Stanley Glanz and served as chairman of the Re-elect Sheriff Glanz Committee in 2012. It would be understandable if one were to conclude that Sheriff Glanz won’t be seeking reelection once his current term in office is completed.